Much of the technology that is changing the drum and bugle corps activity is being employed off the football field. Long before the first amps get switched on in Drum Corps International competition, groups across the country are turning to technology in the off-season as a tool to better prepare students for their summer drum corps experience. 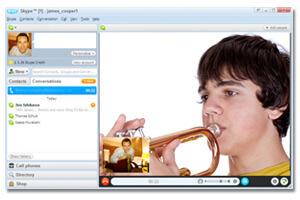 Programs like Skype, YouTube and SmartMusic (a commercial software app designed to remotely track the progress of students) are presenting corps with new and creative methods to help prepare students for the rigors of the drum corps season, giving them a head start that prior members could hardly dream about enjoying. Since most members now have widespread access to computers and the Internet, corps managers are able to utilize those tools in an effort to engage more students while keeping the overall cost of participation for them in check. In return, prospective and current members are receiving a high level of instruction with face-to-face access to top-notch instructional staffs on a more regular basis. Colts Operations Director Vicki MacFarlane and Madison Scouts Executive Director Chris Komnick recently talked with DCI.org to share how they've been utilizing video technology in their respective corps for rehearsals, instruction and even as a replacement for in-person auditions. DCI.org: How have you been incorporating video technology into your corps' operations? Vicki MacFarlane: We've been using SmartMusic, Skype, YouTube and other apps to give students individual lessons, assignments, and input and feedback for auditioning for about the past six years. We have increased the use with corps members every year, allowing the instructors to tailor it as they see fit. Chris Komnick: Over the past four seasons, the Scouts have extensively integrated SmartMusic into our brass program as a virtual rehearsal tool. In 2012, we also began assigning several video assignments in between camps that had members upload their video performances onto private Facebook pages for critique by staff members. In addition, this year our brass team is exploring conducting our preliminary auditions via live-video conferencing. The visual team agreed that they would conduct their initial visual screenings this way as well. Video conferencing is now accessible to virtually everyone, and it's gotten to a point that it's reasonably practical for us to implement for our initial round of auditions. How have you been able to make these technologies work for you and your members? VM: Generally, a caption head or technician will give an "assignment" to their section between rehearsal camps. We've found the most efficient method for us has been to allow students to record each assignment within a given time period and then upload it to us as a private YouTube link, visible only to specified staff members. Staff members then review the individual videos and provide feedback at their convenience. CK: For our auditions, a brass prospect registers and then receives a downloadable PDF of our brass manual. From there they are directed to an online scheduling page where they select an audition time that works best for them. They receive instructions to download and test Oovoo, our video conferencing platform. There is no cost to install the app and it supports a number of cross-platform devices. The prospect prepares for the audition as instructed in our brass manual. During the live-video audition, he logs into Oovoo and will get to meet one of our brass instructors and one of our visual instructors. At this point they will engage in conversation and begin to go through the audition process. Prospects will play certain passages and exercises and be asked to march to different exercises as well. The feedback during the audition is immediate, and the staff members will also follow up with the prospect via e-mail to summarize his critique. Within 48 hours of the audition, the student will be notified whether he will be asked to attend our in-person callback audition camp in December. How have current and prospective corps members reacted to this? VM: It's been good for us. We've found that for lessons many of our corps members prefer to Skype directly with staff members because it allows for feedback in real time. CK: We are having a very positive response. In rough numbers, we're seeing a more than 30 percent increase in paid brass auditions over this time last year. Part of it is that it's less expensive ($25) and less risky for the prospective member; but the verbal feedback has been positive as well. In the first few weeks of offering this option, we had more than 150 brass players registered to audition via video conferencing. How else do prospective corps members benefit from this? CK: Those who aren't invited to the next audition are provided with feedback on what they need to do to improve their skills in the future. The Scouts work to make the audition process a positive learning experience regardless of the outcome. We also make suggestions and offer introductions to other groups if the applicant wishes to continue pursuing membership in a drum corps. I believe the participation costs for drum corps have escalated to the point that fewer and fewer people are able to participate. We deliver tremendous value for the cost, but if that cost is out of reach, the value delivered is meaningless to an individual. We felt that by implementing this live video audition process we could lower the initial cost to audition and eliminate the early travel costs normally incurred by prospective members, costs they had to spend before learning if they were ready for drum corps. I think we can reduce the participation costs of a prospective member by close to $500. We are also eliminating our March camp and plan to utilize SmartMusic and video conferencing to rehearse virtually during that month. The Colts have also decided to eliminate their usual March rehearsal camp as well. Why? VM: It has been challenging to get the full corps together during the February through mid-April period, when winter color guard and indoor marching percussion events are in season. The Colts excuse students from attending camp for school events during the year, so there are often a number of members with conflicts or who are torn between multiple responsibilities. There are also high costs of travel for students, some who live upward of 10 hours away from Dubuque. With all that in mind, we decided to take off our busiest month that averaged the lowest attendance. In its place, we're requiring corps members to check in with us via virtual lessons. So we'll be decreasing the individual's expense to participate, and yet we'll become a stronger group even though we'll be spending less time together as a full corps during the off-season. How important is it to reduce cost for corps members? Is it becoming more difficult to join and participate in a drum corps? VM: I don't know if I'd say it's getting harder to get students into the corps, but it seems over the past few years that interested students have fallen into two categories. Either they have all the means necessary to do what they'd like, or they struggle to participate on a regular basis and still pay their fees in full. For our corps, the extremes seem stronger than they've been, with less middle ground. "Feast or famine" would be an extreme way to describe the financial situation of the members. Obviously, we want to look out for our corps members' best interests and maximize their time and potential. Finances tie into all of that. Is the corps also able to save money too? CK: Yes; we've been able to eliminate some of the costs we would have incurred running satellite auditions. Not having to pay for facility rental and staff travel helps our overall budget. My goal is to have no increase in corps member tuition for 2013 and some of these changes are helping us achieve that goal. Are there drawbacks in utilizing this video technology? What place does it have in the future? CK: While the video conferencing technology is quite mature, it's not without flaws. I think our biggest issue includes the field of view when doing visual exercises. Most times the prospect is alone and sets up the camera with a static view. We are finding it hard to assess personal technique in this fashion, since the view needs to be so wide. Also, if the Internet connection is spotty or low speed, both the audio and video can become disrupted. This isn't an issue for a "first read," but it is something we've noticed. The potential latency in audio/video synchronization is one reason we aren't implementing this for percussion at this point. However, we have accepted video auditions for both color guard and percussion and continue to do so. These are videos that are captured and then uploaded, so the quality issues are better resolved. VM: The technology doesn't replace the need to rehearse as a corps, but it supplements our full-corps rehearsals. It provides a way for yearlong development in a more regular manner than traditional once-a-month rehearsals do. It really comes down to what is educationally best for the students, and we're finding that the regular weekly contact with them increases skill levels sometimes more than one 48-hour weekend of block scheduling. Maximizing everyone's potential is crucial for us. Many corps will be hosting their off-season audition camps throughout November and December and are still actively recruiting members to join their ranks. As these groups get ready for 2013, we've assembled a handy webpage to help prospective members get their start in becoming the next members of Marching Music's Major League. Visit DCI.org/audition to find a variety of resources including a list of audition dates and locations for World and Open Class corps, links to additional information about each group, and an age calculator to help you determine if you are eligible to march this summer.